Our 10-year-old son, Brody, loves to read. Learning about American history? Not so much. But once he discovered the Rush Revere book series, he has become a lover of learning about the founding of our amazing country. The first book, Rush Revere and the Brave Pilgrims, begins aboard the Mayflower and follows the Pilgrims through their first winter in the New World. American history teacher Rush Revere time-travels with two young students to see American history first-hand. Always riding along with him is his trusty talking horse Liberty, who is hungry for knowledge –and food! The second book, Rush Revere and the First Patriots, takes us to the time right before the start of the American Revolution where we meet exceptional Americans including Samuel Adams and Patrick Henry. Rush Revere and the American Revolution is the third book in the series and takes us right to the heart of the American revolutionary action. In the fourth book, Rush Revere and the Star-Spangled Banner, Rush Revere and his crew take a field trip to Washington D.C. and visit national landmarks including the Washington Monument and the White House to learn about American government. Back in time they see the writing of the national anthem and witness Dolley Madison save a patriotic American symbol. 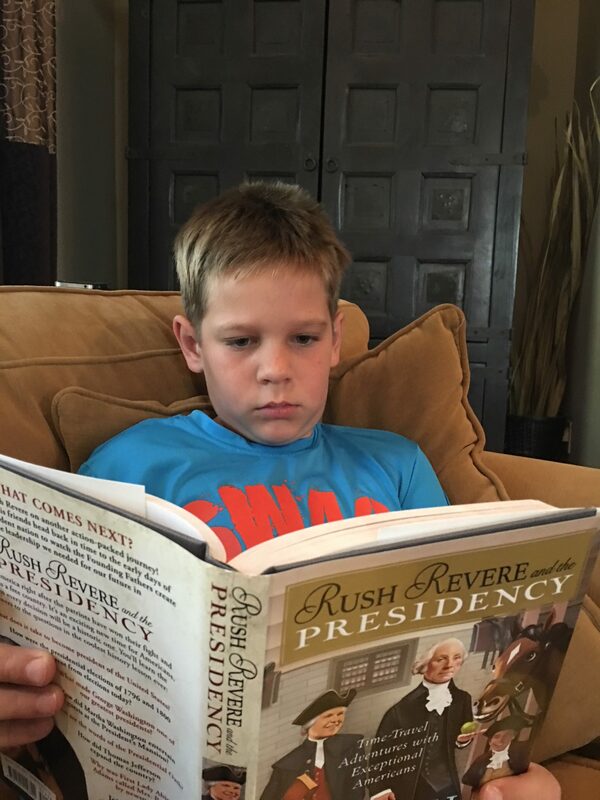 And in the pic below, Brody is reading last book in the series, Rush Revere and the Presidency. It focuses on American elections, leadership and the early presidents. 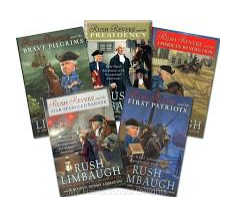 I highly recommend the Rush Revere book series if you want your kids to get a full picture of what our founding fathers accomplished to make America the greatest place on earth!